(c) other leg; (d) assorted innards. Joe Sunday was Första Advent, marking the opening of the official Swedish Christmas season. How has it been going so far? The advent fireworks planned for Sunday afternoon were cancelled due to wind. Norwegian weather reports that November, 2011 was the warmest November in 111 years (only because they've only been keeping track for 111 years, mind you). I'm nursing a sprained wrist, because I fell off my bicycle on the single icy morning in November. Oh yes, and the cat hates Christmas. 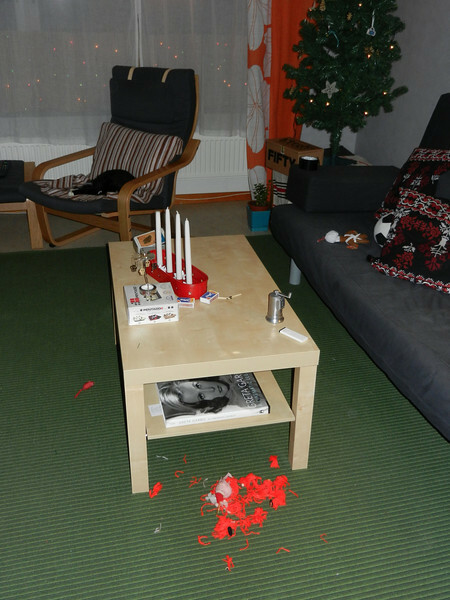 Last year, I put the tenacity and violence of his attacks on our wee fake Christmas tree down to kittenish vigor. In the months since, he's been a calm, friendly, nearly unflappable little guy, quickly charming both house guests and next door neighbors. So, I think I can be forgiven for choosing to believe that he might have grown out of his hatred for the Yule season. Far Left: table where tree was 30 seconds ago. Right: innocent cat, sitting under chair. 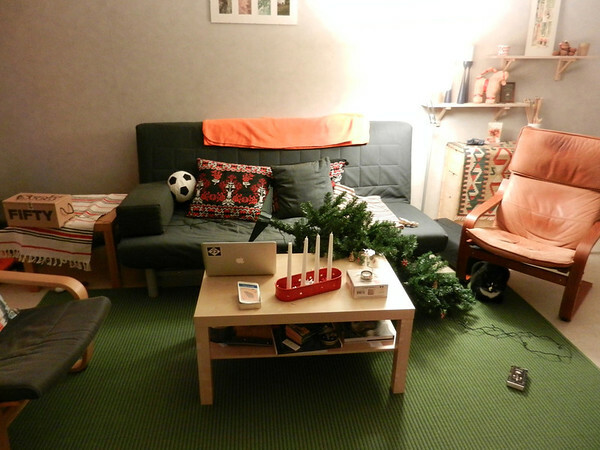 I could tell things were not going to go well the minute I walked in the door with the Christmas tree. Is it wild fancy that, looking back at it now, I recall noting a murderous glint in his eyes? Did he, perhaps, slaver ever so slightly, as he plotted his vengeance on that plastic conifer, a vengeance so very long delayed? At the time, I dismissed such thoughts as mere fancy, the product of an overactive imagination, and so I set about my business, innocent as can be. That poor tree never stood a chance. Although, exactly how he managed to drag it halfway across the living room that night remains something of a mystery, given that I only left him alone for a moment. Background: the cat, sleeping the sleep of the just. Foreground: the tattered remnants of his victim, one S. Klaus. 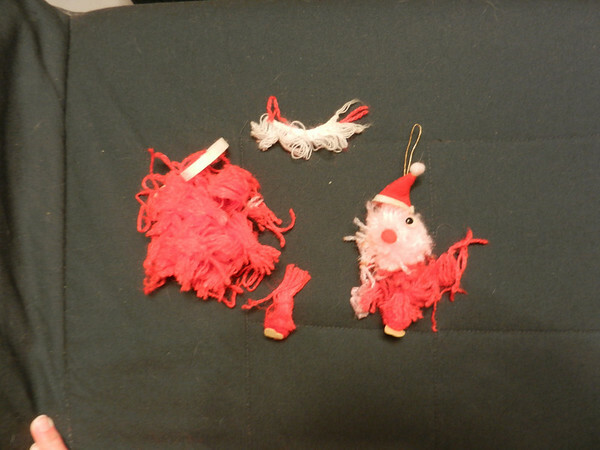 Farewell, little yarn Santa Klaus. Your sacrifice will long be remembered.